As we all know, the Great Recession walloped pension and retirement plans, and few were immune. Multiemployer plans in the U.S. were no exception. Five to six years later, we’re seeing rebounding, thanks to an improved market and the difficult decisions made by trustees to improve plan funding. Plans have been affected not just by the turbulent economy but also by changing demographics. An aging population means the number of active participants in plans for whom employer contributions are made is falling, while the number of inactive participants (chiefly retirees) is growing. This has a great impact on DB plans, as cash outflow is outpacing cash inflow. At the end of 2012, the median DB funded percentage was 77.8% on a market value of assets basis. This is a significant improvement over the median funded percentage at the end of 2008, which was 67.4%, but still short of the 88.6% median funded percentage at the beginning of 2008. ​Among multiemployer DC plans, the median investment return for calendar year 2008 was -20.8%. The median annualized return over the ten-year period from January 1, 2003 through December 31, 2012 was 5.4%. 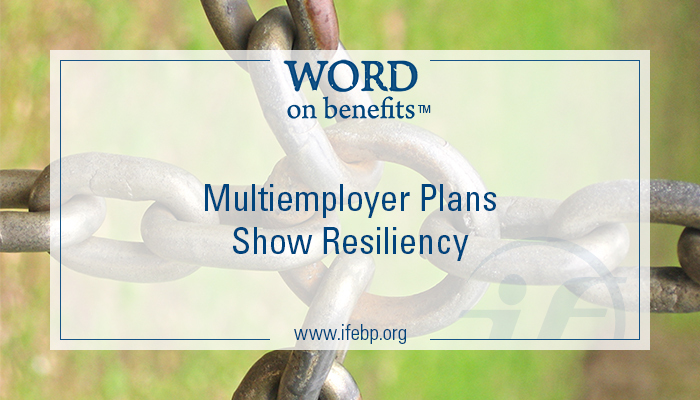 The average account balance for a participant in a multiemployer DC plan is about $30,000. Average balances have grown over the past decade with contributions and investment returns.